The Herero are a pastoral cattle-breeding people who migrated to Namibia several centuries ago. It is believed that they formerly lived in a country with water and reeds, known as Roruu, before migrating further south. No one has, however, succeeded in tracing this legendary African marshland. According to oral tradition, they moved southwards from the great lakes of East Africa, crossed into present-day Zambia and southern Angola, and arrived at the Kunene River in about 1550. After inhabiting Kaokoland for some 200 years, a large splinter group led by Maendo migrated further south, leaving the Himba and Tjimba tribes behind. They reached the Swakop River valley towards the middle of the 18th century. During the 19th century they moved eastwards, eventually establishing themselves in the northern-central areas of the country. In the first half of the nineteenth century, the Herero and Mbanderu were still living in family units headed by an omukuru. The absence of a political structure can be attributed to the system of dual descent. A person’s status in the family hierarchy, the place of abode, and traditions, are determined by the paternal line, oruzo. Control and distribution of all movable property, on the other hand, is determined by the maternal line, eanda. The matriclans exert control over most people’s property, especially cattle, and supervise the application of traditional laws of inheritance. The localised patriclans, on the other hand, take responsibility for sacred objects and the holy cattle (ozohivirikwa), the exercising of authority in the family, succession of chiefs, priesthood, ancestral fires and the ritual food taboos. The colonial wars and Herero German war of 1904–1907 resulted in a drastic decrease of the Herero population. Under General Lothar von Trotha and his infamous Vernichtungsbefehl (proclamation of extermination), a large number of Herero were massacred. Left without land and cattle, the survivors practically disintegrated as a group. Many fled to Bechuanaland (Botswana). When South Africa took over administration of South West Africa in 1915, the refugees began to return and were gradually allocated home areas such as Aminuis, Epukiro, Waterberg East, Otjohorongo and Ovitoto. Despite the suppression of their traditional culture, confiscation of tribal lands and the restrictions of labour laws, the remaining Herero managed to keep their bonds of family life, tribal solidarity and national consciousness alive, as is demonstrated by the annual Herero Festival on Maharero Day in August when various units of paramilitary organisations parade before their leaders in full dress through the streets of Okahandja. Similarly, the Mbanderu and the Zeraua tribes honour their captains at festivals in Gobabis and Omaruru respectively. In the nineteenth century, under the influence of the wives of the missionaries, Herero women developed the voluminous Victorian-style dresses that the more traditional of them wear to this day. The distinctive headdress with its two points symbolises cattle horns. Today, Herero-speaking Namibians number over 130 000. They can be subdivided into the following groups: the Herero proper, with the traditional chiefdoms of Maharero (Okahandja), Zeraua (Omaruru) and Kambazembi (Waterberg); the Ndamuranda; the Tjimba Herero of Kaokoland (Kunene Region); the Mbanderu, who live in eastern Namibia, especially in the Gobabis District and the reserves of Epukiro, Otjombinde and Omongua (known more commonly by the Nama name, Aminuis); the Himba of the Kunene Region; and other smaller factions in northern Kunene and south-western Angola. Their language belongs to the Bantu group of languages. The traditional ekori headdress of adult Herero women consisted of a three-pointed leather cap with a veil in front, usually worn rolled up. This ekori differs in shape from that of the Himba, and has higher points. 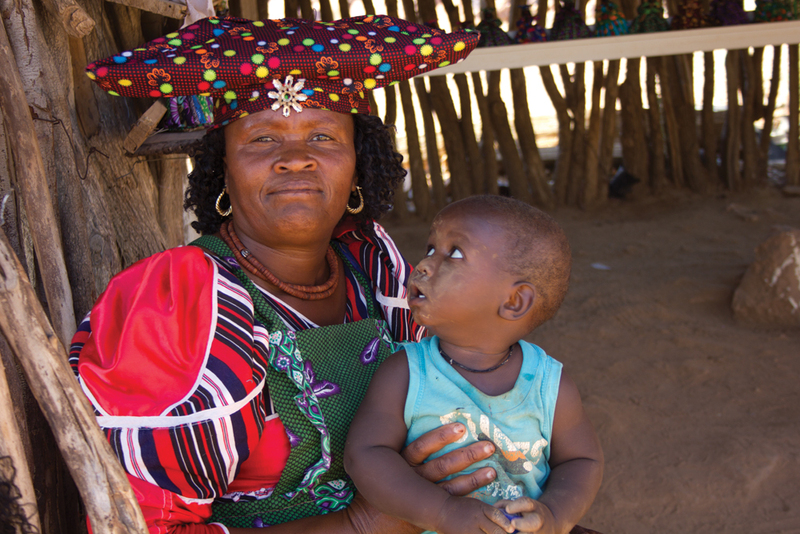 After the advent of the missionaries, an older Herero woman’s ekori was replaced by the otjikaeva, a headscarf made from fabric, still worn today as a triangular otjikaeva by older Herero women, the two lateral points representing cattle horns, cattle being central to the Herero culture. The Omaheke Region is home to different language groups, with festivals giving them the opportunity to display their different cultures. Participants are mostly pupils from primary and secondary schools in the area showcasing their different cultural performances to onlookers. As a side project, the Living Culture Foundation also supports the Herero theatre group, Erari. The group performs a play based on the history, culture and traditions of the Herero people who moved to the Waterberg area in the 19th century, offering the spectator access to information on this interesting group of Namibians and creating curiosity and craving for further insight. The play is performed every Wednesday in Okakarara, near the Waterberg, on the premises of Steps For Children, as entertainment for visiting tourists. A traditional meal is served afterwards. Steps for Children runs a kindergarten, soup kitchen, sewing room, computer school and internet café, a bicycle sales and workshop, and supports schoolchildren with their homework. Okaepe is a small village located 54 km east of Okakarara off the tarred road (D3822) in the direction of Coblenz. Inspired by headmistress, Batseba Rukero, children of the primary school in Okaepe village have been trained to entertain tourists with traditional dances, games and songs, ceremonies and scenes from everyday life. Performances depict the traditional Herero way of life, the close relationship of the Herero with their cattle, the bravery of the herders when defending their herds against predators and Herero wedding ceremonies. 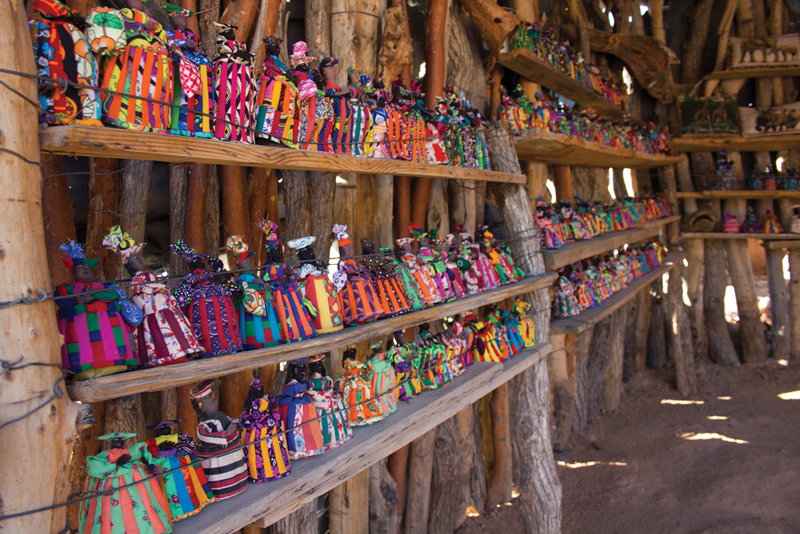 Tours are undertaken to the San community where visitors learn about the San history and way of life. Located in the small settlement of Okakarara, the Okakarara Community Cultural and Tourism Centre was inaugurated in August 2004 during the 100 years commemoration of the Battle of Ohamakari, fought in the early liberation struggle of Namibia’s indigenous people. The centre serves as a link between present and past, and between visitors and residents, and works towards enhancing a common future in and around the traditional lands of the Herero people. The site hosts a café and kiosk, a small souvenir shop and a dialogue circle for meetings and team-building exercises. Camping sites are also available. Kambahoka Restcamp, situated next to the Aminuis saltpan, 180 km south-east of Gobabis, consists of seven campsites, each with a table and barbecue area, and basic facilities. Visitors are informed about cultural aspects such as the significance of the ‘sacred fire’, an essential facet of the traditional Herero household, for spiritual well-being and connection with the ancestral spirits. Activities offered at Kambahoka include San/Bushman, Batswana and Bakalahari singing and dancing, a walk in the pan and a trip to the site of a former German camp in the Herero-German war of 1904. For those travelling to Bushmanland and the Tsumkwe area via Gam, Kaumbangere Restcamp located 5 km south of Otjinene makes a good stopover. The rest camp has four bungalows, one rondawel, a campsite, and bar and restaurant that serves meals on request. Kaumbangere offers a cultural tour to Otjinene where guests are able to see how the local people live, including how they prepare their food and make the sour milk they favour. They also offer a historical tour to Ozombu zo vindimba, a significant site for the Herero people, as it served as a German base during the Herero-German war of 1904, and from which Adrian Dietrich Lothar von Trotha made his famous proclamation against the Herero people.